Whale feces probably don't cross your mind very often, but when they do, you likely cringe at the thought of their size, sight and smell. Blue whales, for example, grow to be longer than a school bus and rank as the largest animals known to live on Earth, so naturally, they're going to eat -- and poop -- a lot. A new study found that whale dumpings are highly valuable to marine ecosystems, and they're not something to write off as stinky or gross. The new study, recently published in Marine Mammal Science, stresses that blue whale poop is essential to primary production in the Southern Ocean, and therefore benefits fisheries. Blue whale excrement is rich in iron -- a nutrient that's lacking in surface waters of the Southern Ocean. So, when blue whales defecate their iron-rich poo in surface waters, they play a key role in enhancing the food chain: Iron stimulates phytoplankton blooms, the main food source for krill, and these blooms then benefit blue whales, who eat up to four tons of krill a day. "Iron is an obligate component of all life and concentrations of iron are at growth-limiting levels in the Southern Ocean. However, iron concentrations in whale feces are over seven orders of magnitude higher than background seawater concentrations," explained the authors in the study. "A substantial proportion of the liquid whale defecations disperses and persists in the photic zone, where it is available for incorporation into marine food webs." 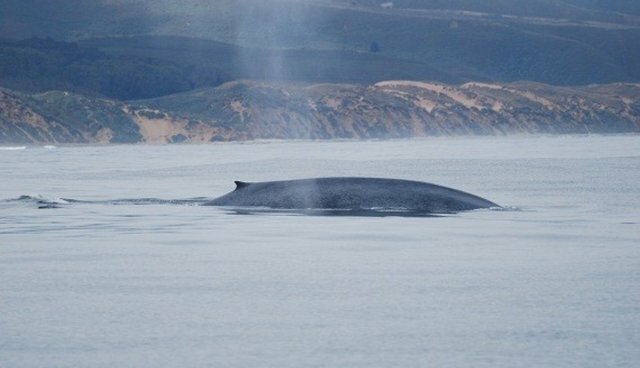 The study disputes a previously-applied theory, known as the "surplus-yield model," which finds that baleen whales compete with fisheries operations by preying upon the same species industry targets -- which in the case of the blue whale, is krill. Using the surplus-yield model, some policy makers have advocated for commercial whaling as a way to manage fish stocks. The author's findings, however, show that the benefits of whale poop compensate for the lost krill, and that the surplus yield model needs to be adjusted to reflect that effect. The results are important for ecosystem management, especially at a time when both blue whale populations recover and the Antarctic krill fishery gains importance. "Our findings do, however, highlight a significant conceptual flaw in the current surplus-yield model by indicating that the recovery of blue whale stocks is unlikely to significantly influence fishery yields in the Southern Ocean," explain the authors. So, the next time you find yourself on a whale watching tour or scuba diving with some marine mammals, just know that their defecation isn't nasty; instead, it's enriching an entire ecosystem and food chain, including some of the very seafood that ends up on your dinner plate.